Here you will learn about difference between java, core java and advance java. Mostly beginner java programmers have confusion about these 3 terms in their mind. Below I have explained them to clear their confusion. It is a high level programming language. Java is available in three flavors. Java is a combination of above there things. It consists of all fundamental or basic concepts of java language. Core java is also called as Java Standard Edition i.e. J2SE or JSE. It is used for making standalone java applications. 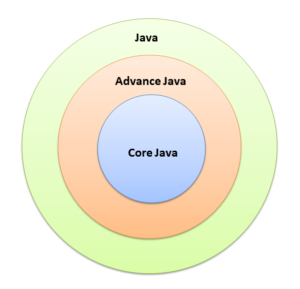 All the concepts of core java are used in advance java technologies. So we can say that nobody can learn advance java without knowing core java. Example: It includes topics like OOPs, Exception Handling, File IO, Collections, AWT and Swing, Threads, JDBC, etc. It consists of advance java concepts, technologies and frameworks. Advance java is also called as Java Enterprise Edition i.e. J2EE or JEE. It is used for making java web applications. Example: It includes topics and technologies like Servlet, JSP, EJB, Spring, Struts, Hibernate, Web Services, Networking, etc. Now I hope it is clear in your mind that what is the difference between java, core java and advance java. Comment below if you have doubts or found any information incorrect in above tutorial.